Maxime & Odile were excellent hosts. From the beginning, they were very welcoming and very helpful throughout our stay. They were also very good and understanding with our two young children. The location was excellent. 10 minutes drive uphill from the nearest town and in a private complex meant it was very peaceful and secure but convenient enough if we needed any groceries. It's a great base from which to explore the French Riviera. 1hr 40min from San Remo in Italy and everything else (Nice, Monaco, Cannes etc) between 20mins to an hour depending how far you're going. The apartments were well equipped and clean and the pool area was wonderful. The gated pool area gave peace of mind that our kids couldn't wander in or out of the pool unsupervised. We really enjoyed it and if we decide to visit the French Riviera again we'll certainly be checking if its available as we'd happily return. Thank you! Place is wonderful, away from all the noise and pollution...swimming pool brilliant. This property was exactly as listed on the site HomeAway. The real thing was even better. Since there's no picture to describe the relaxing atmosphere of the property itself and the kindness of it's owners. Each morning starting with bird songs, most natural waking up in a beautiful swimming pool. End of the day setting off with cool summer wind, spectacular sunsets in beautiful garden with echoing sound of frogs somewhere in the distance. Garden beautifully maintained with such a sophisticated taste and and eye for a detail. Friendly owners Odile an Maxime offered lot of tips for day trips and spots not to miss, among which to the most beautiful village in France, Gourdon. If you are eager to find a place far enough from overcrowded top holiday destinations and at the same time close enough to grab them once you are ready for them - this relaxing, charming and most of all welcoming property is an ideal choice for you, no matter if you are a couple or a family. Highly recommended! Just the place to relax after a hard years work.The property was all it claimed to be in the brochure. The appartment was spotlessly clean, adequately furnished, and private, and the peace and quiet was only broken by the birdsong. 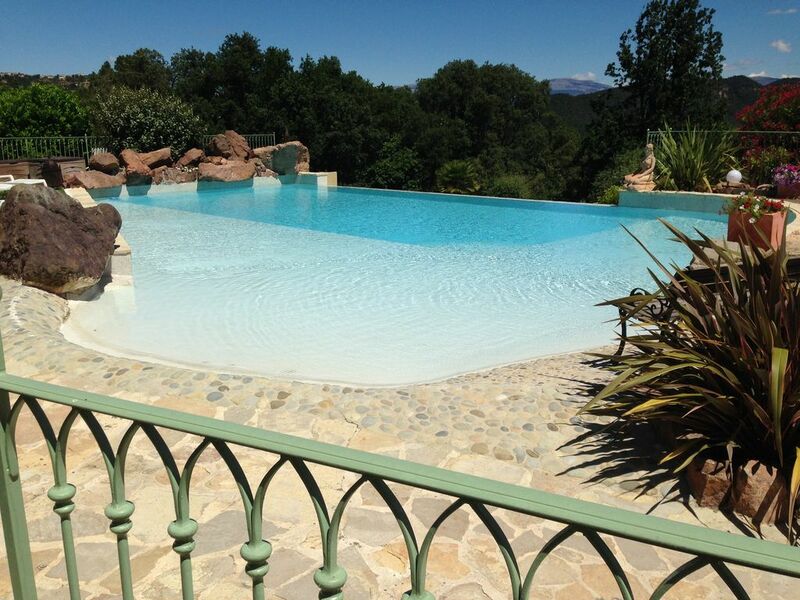 The view across the infinity pool down the valley to Cannes was amazing. Close enough by car to Markets and Shops to be convenient without being crowded and enough local restaurants and eating places to satisfy any gourmand. The owners could not do anything extra to make you more welcme and at home. All in all our best holiday for many years. Definitely a return next year! Cadre absolument magnifique et tranquillité, tout en étant proche de la mer et des commerces, parfait. Quel plaisir de passer un séjour dans cette propriété mariant calme, beauté et chaleur des propriétaires. Situé à 10 minutes de la mer (plages très facile d'accès , au choix de sable ou côte rocheuse) , vous vous retrouvez dans un grand parc avec une belle propriété et une piscine spacieuse aussi agréable pour les grands que les enfants en bas âge grâce sa plage entourant le bassin de nage. Transats en grand nombre, parasol , aménagement et décoration soignés vous permettent de vous reposer et de profiter de cette piscine à débordement en tout point magique. Le logement est impeccable : beau, très propre, et avec une température tempérée ( malgré la canicule) même en l'absence de climatisation. Enfin vous côtoyez les propriétaires d'une extrême gentillesse, de bons conseils pour bien découvrir la région, d'une grande disponibilité et aux petits soins pour leur locataire. Une location idéalement située pour profiter de la mer facilement sans être dans la cohue du littoral, à 60 minutes de voiture maximum de toutes les richesses de la région . A8 highway exit 40 MANDELIEU Frejus by the Directorate RD7 pass on the left Saint Jean de Cannes, then Escaillon and continue until Park Residential.